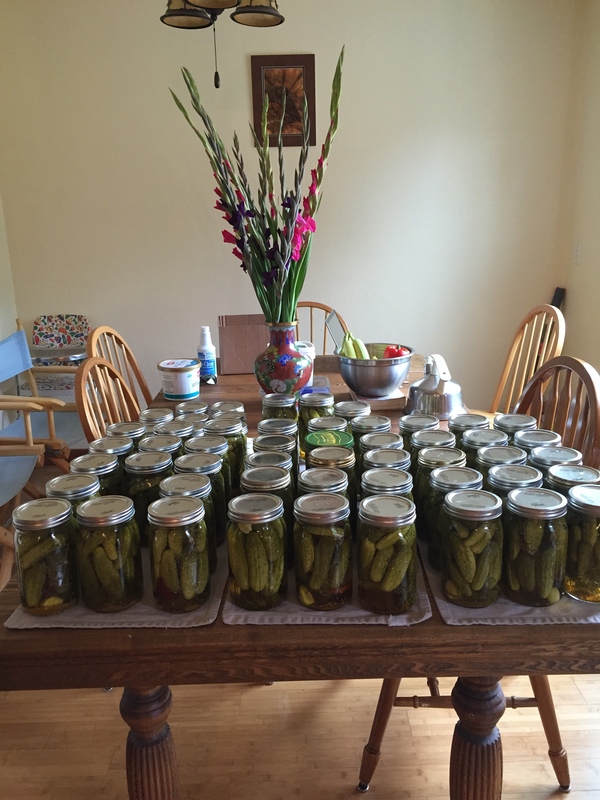 I look forward to pickle camp each year. 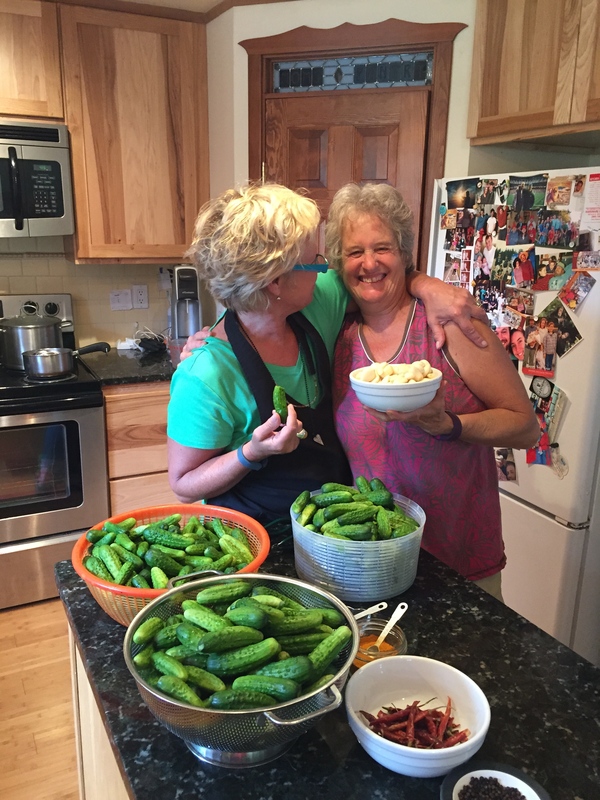 Friends and family gather to share stories and the thrill of scrubbing cucumbers and peeling garlic. 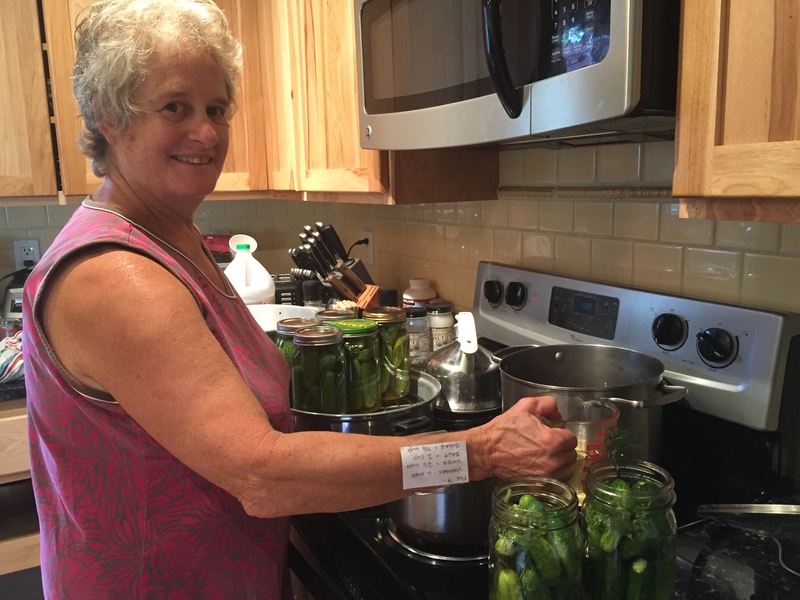 There are also plenty of laughs and good food enjoyed by all as we sit back at the end of the day and get that warm feeling about what we accomplished, and begin to start counting down the calendar days until Thanksgiving, when the first jar is popped open and pickle camp comes back to life, one jar at a time. Fresh, ready-to-pack ingredients line the counter for packing jars. Elsa had the liquid measurements on her wrist likened to a quarterbacks play list. The assembly line behind her was moving fast. 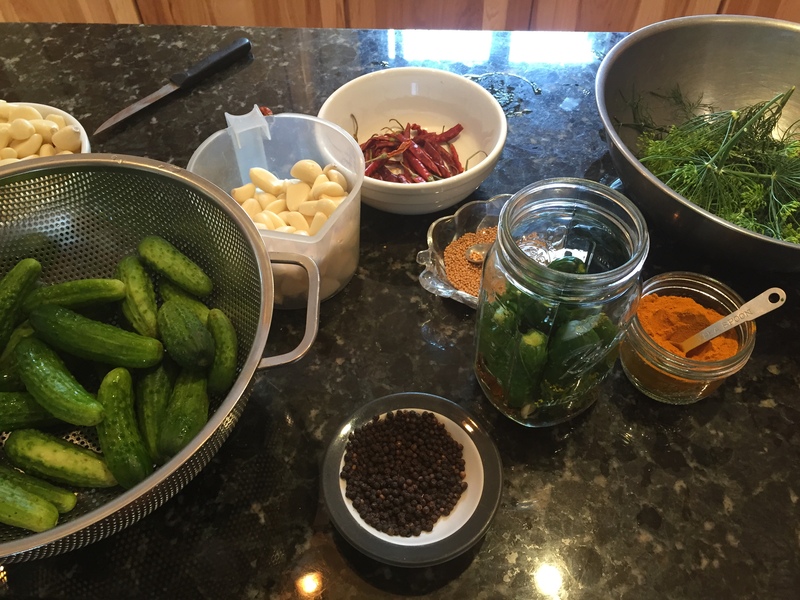 As jars are being filled, another garlic clove, red chili or a pinch more of dill can sneak into the jar, making the recipe really just a guide line. Place cucumbers in jar standing on end, pack tightly. Fill jar with vinegar liquid mix, place canning lid on top and screw lid on tight. Place into a water bath canner (water should cover top of the jar) and bring to a rolling boil. Process for 15 minutes. Do not open until Thanksgiving. I have no patience for waiting on the greens in the garden to mature, so with a little help from my local farmer John at Maple Rock Farm, I learned to create and use some of the bounty early. I have never been good at following recipes and measuring. Everything is done by eyeballing, more liquid or greens can be added to get consistency desired. Fill your blender with 2 cups of chopped parsley, 1 cup chopped walnuts, 3-5 cloves of garlic. Pour in ½ cup of good olive oil (I used Olivar De La Luna organic extra virgin). Begin blending, add more olive oil as the paste begins to pureé. You do not want it so thick you cannot get it out of the blender, but it should not be too runny. Use a spoon and scoop into ice cube tray and freeze. 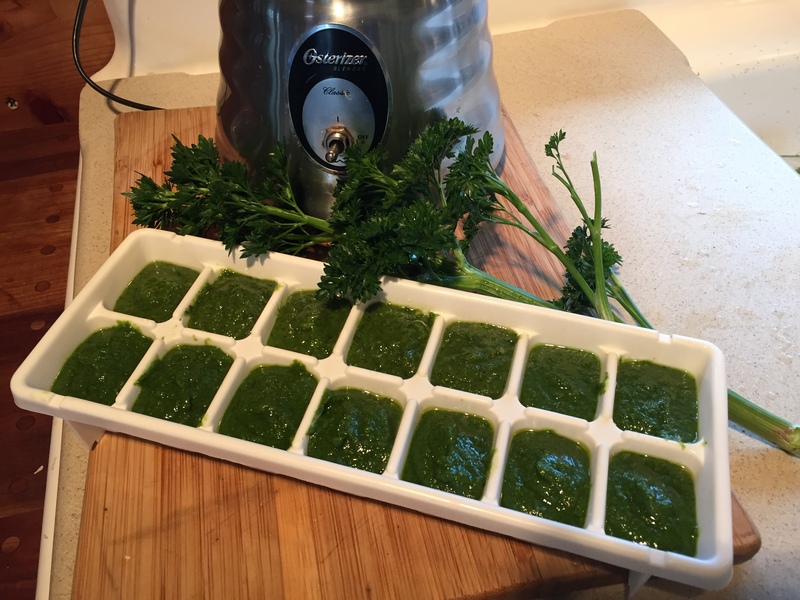 Once cubes are frozen solid, place the tray in a pan of hot water for a few minutes to loosen cubes of pesto, then place them on a cookie sheet to freeze hard again, then store in a container in the freezer. When you want pesto, place a cube (or several) in a bowl and thaw to room temperature. Add hot or cold pasta and mix. Grate parmesan cheese over pasta and mix. Do not add cheese before freezing, (it will turn into globs when heated). 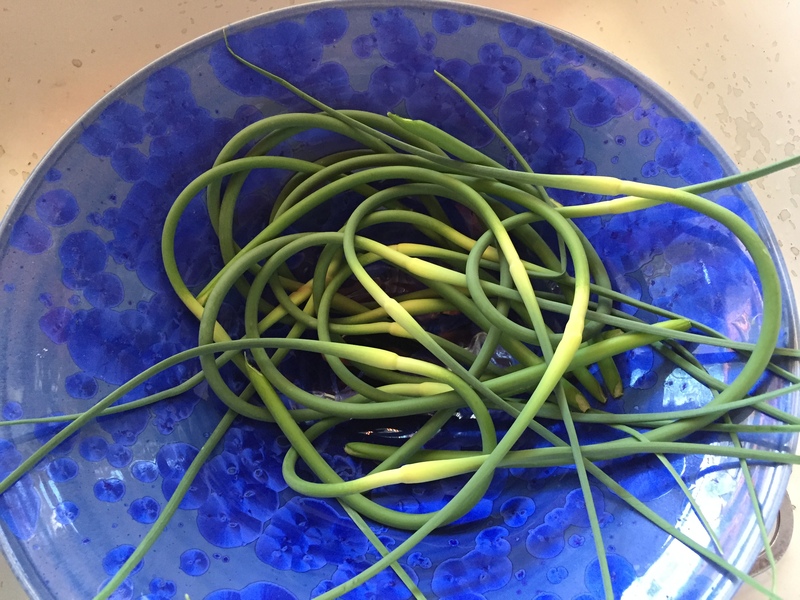 Early summer-late spring, cut the garlic scape off of last year’s garlic you planted in the fall. These can be chopped and put into dressings, sauces and salads, but I like to make a garlic paste that is versatile and keeps in the refrigerator for several weeks. Fill blender half full of chopped garlic scapes, add ¼ cup of good olive oil and begin blending. You will add more olive oil as the combo begins to blend into a chunky paste. This paste does not get smooth but will have texture. Add more oil, or scapes, until you get a consistency of soft paste (if it is too thick you will not get out of the blender). 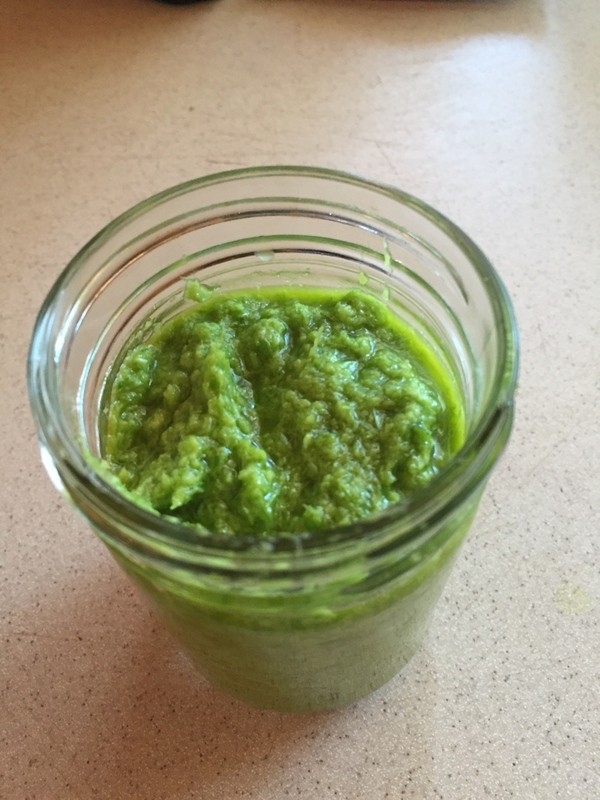 Place green garlic paste in a mason jar with lid and keep in the refrigerator. I use this as a rub on chicken; add to tomato paste-balsamic vinegar-olive oil as a marinade for beef; add to good olive oil-balsamic vinegar and salt/pepper as a salad dressing; stir into pasta; add to any dish you would add garlic to. Sometimes I stray too far from the barn, but a day at Coffelt Farm Stand brings me right back to what really is important, family, farming and friendships. Local berries make a sweet colorful gift and reminds me of kitchen time with grandma. My grandparents had a dairy farm complete with chickens, horses and bottle fed calves. Grandma’s garden filled canning jars and the cellar was filled with pears, apples and plums from the orchard. These are fond memories deep in my soul. 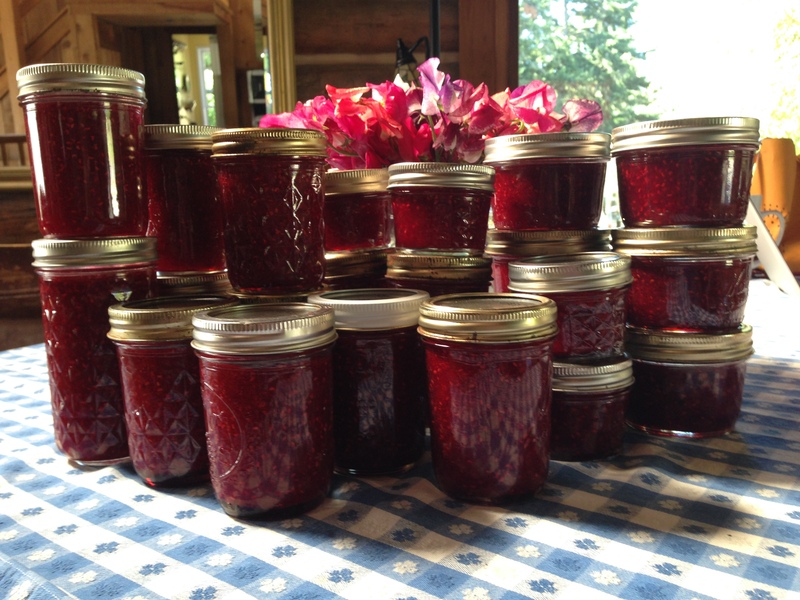 I spent many summers picking berries with grandma, never wanting to eat any so my bucket would be as full as hers. Jams and pies were yummy results. I still remember when grandma left the pie making to me for a family gathering. Her shared crust secrets and faith in me still show in my pies today. 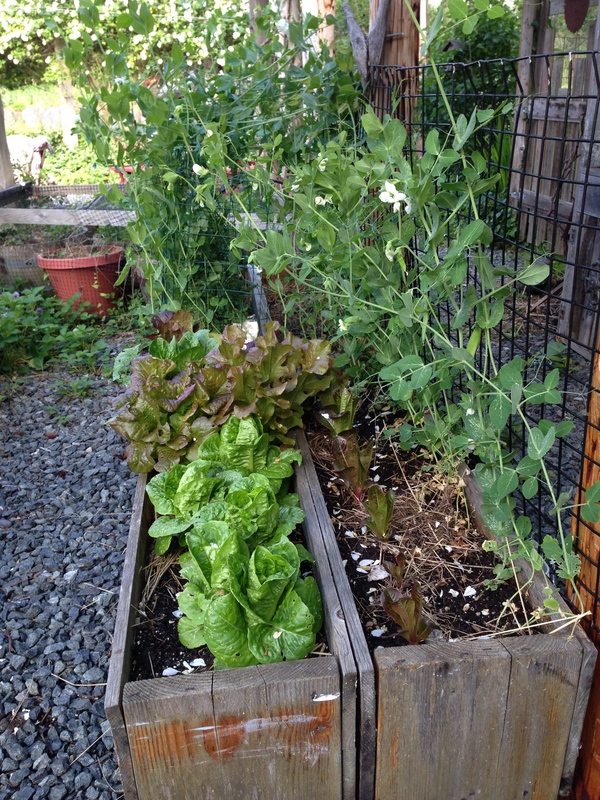 Grandma T’s garden shares ready to eat sweet peas and the promise of greens for a meal. Wanting to get out of the city, I moved to Orcas Island 27 years ago with 3 sons and a desire to find my roots again. The boys are grown and raising their own families now. It is my garden and orchard they will remember in their hearts and souls, as well as the many trips to local Orcas Island farms. 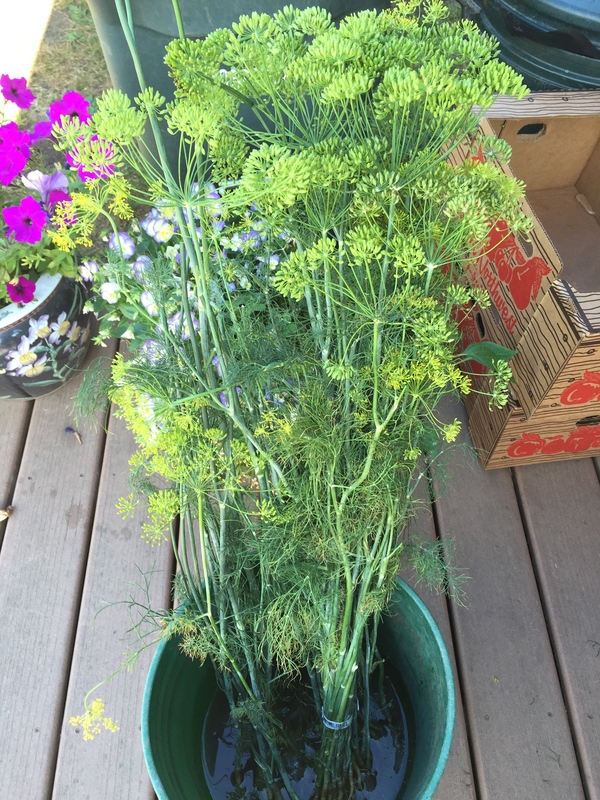 In my garden, each year I look forward to planting new things, talking to other farmers about their favorite seeds and sharing tricks to invite worms to feed the soil. I have starts from Sid Coffelt, plum trees from my great grandma’s orchard, tomatoes from John Cadden, garlic from Mary Ann Sircely, raspberry bushes from my mom, Arlene Carlson and blueberry shrubs from Faith Deeds garden. There is much heart and soul in my garden and I dance with joy thinking about the harvest with my grand kids!!! Brand new lambs and a proud mom. 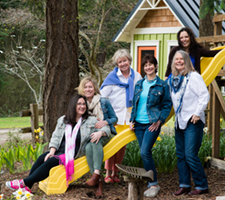 The Coffelt Farm, located in Crow Valley, Orcas Island, gives tours to school children in the spring time when new born run the barn yard. 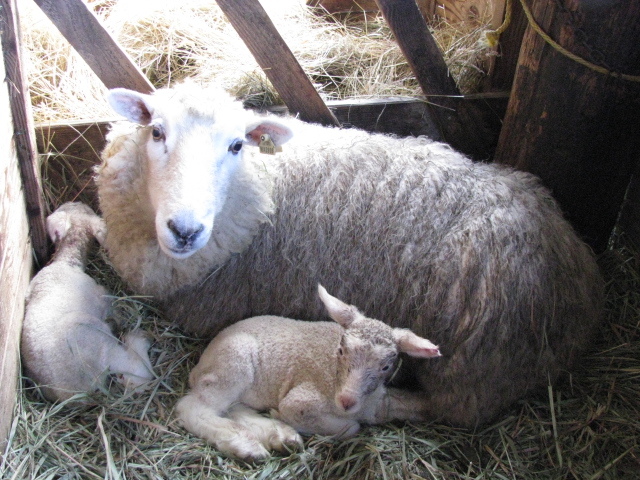 This spring the farm welcomed several new piglets, lambs and a couple of calves. 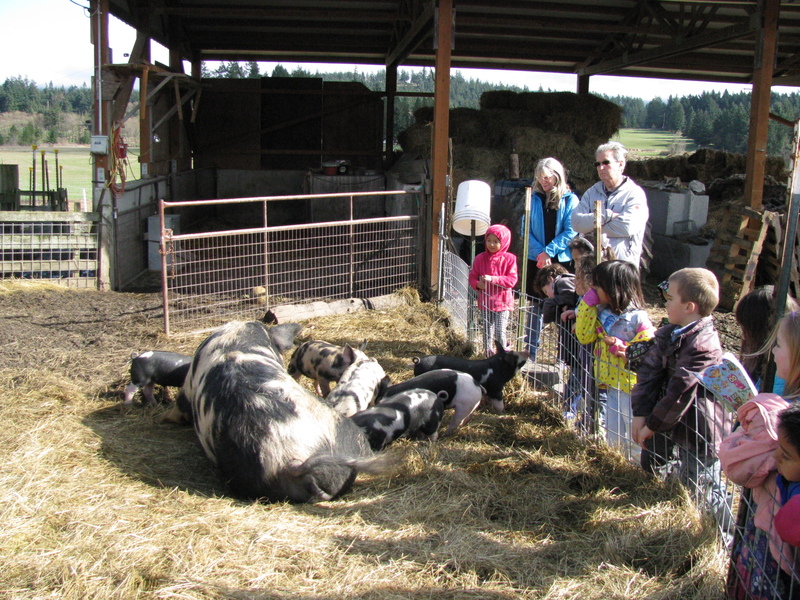 Orcas Island School children enjoy a day on the farm learning about all the animals and what it means to be a farmer. This farm girl says get busy, visit a farm, offer some volunteer time in a garden, share an afternoon canning the harvest, spend time with your grandma, bring a friend and create a memory to nourish the soul.